The Adventures of Sam and Caroline: We're going to India! We bought our flights last night, and we're going to India! 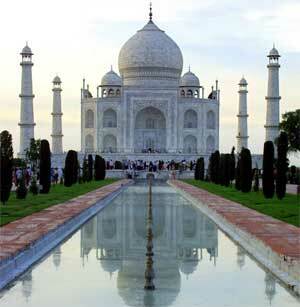 We're flying into New Delhi, arriving on February 6, and we'll be there until February 19. It's not as long of a trip as we were hoping for, but it's the best we could do working around our work schedules and India's weather. Anyway, we're really excited! We haven't planned anything yet, but we're tentatively thinking of doing the Golden Triangle and Kerala. For those of you who don't know, the Golden Triangle is a common tourist route that includes Delhi, Agra (where the Taj Mahal is), and Jaipur (the capital of the state of Rajasthan). But we're definitely open to suggestions! Have you been to India? Do you have family or friends there? What would you recommend we make sure to do? What is overrated that we should skip? And by any chance, are any of you going to be in India during that time?